VIDEO: Sprayer power: Is electricity the next big thing in spray adjuvants? WOODSTOCK, Ont. — Getting fungicides and insecticides into the canopy and to the underside of leaves is a challenge for most sprayers. Small droplet sizes and even coverage are needed for this and for the fungicide lacquering required for control in most non-systemic products; and that comes with the risk of drift. 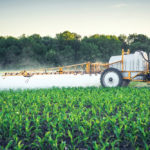 The concept, and the tools, to add an electrical charge to spray at the nozzle have been around for more than two decades, but mostly the technology has been relegated to an exclusive group of expensive crops and some vegetable operations, where fungicides are applied with high frequency. Creating a positive charge in the droplets makes them more likely to seek out a plant and attach to its tissues, and that was long the selling point of the technology. “However, the droplets have to get very, very close to the leaf before they have enough power to cause much of this to take place. So getting the droplets into that position is necessary,” said Jason Deveau from Ontario’s ministry of agriculture. 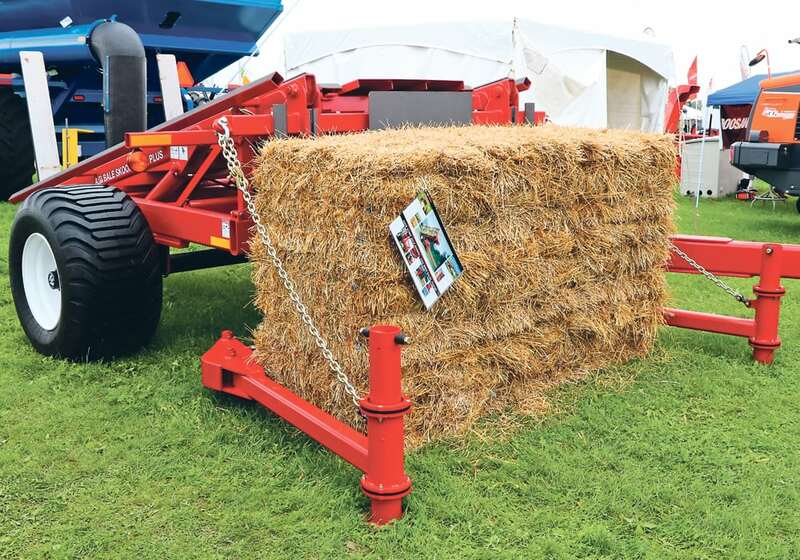 Deveau recently told farmers attending Canada’s Outdoor Farm Show in Woodstock, Ont., that while the concept and the equipment is good for use in limited applications, the thing that makes it work is also its biggest detractor. Very fine droplets are key, he said, but that creates problems with droplets drifting off-target. “Drift is the issue. That electrical charge will make them more sticky with plant leaves, but they have to get there first,” he said. Farmers at the event got to experience first-hand the technology’s ability to provide a very high level of coverage, even in a well-canopied crop and on the underside of leaves. They did also see a small cloud of spray that didn’t find an immediate home. “For fungicides, you might say the neighbours aren’t going to complain about getting a free-application from my drift, it isn’t dicamba after all. But that isn’t the right thing to do and heck, you paid for that spray. Not the neighbour,” said Deveau. He points out that while few are currently addressing the effects of fungicide overspray on soils, the products do play a role there as well. “Anytime your (application) products aren’t going where you intend them, they will be landing someplace. Some products, like glyphosate, might not do much of anything. But others are getting busy and doing their jobs, even fungicides,” he said. “So finding new ways to improve plant delivery is important for the industry,” he said. The tiny droplets used in this type of sprayer are created without a traditional nozzle. The fluid is passed through a small orifice and then air is used to shear off the droplets. That creates droplets in the 35 to 45 micron size range. Similar to the width of a human hair. “If you are thinking this makes some very fine droplets you would be right. So they are going to need some direction,” said the spraying systems specialist. That direction comes in the form of a stream of air, provided by a roots-type blower. Travelling in boom parallel to the spray, air pushes the tiny droplets though a hollow cone nozzle with an integrated electrically charged tip into the crop and toward the soil, pushing the tiny droplets into the close contact zone with the plants. Water sensitive paper showed farmers at the event the potential for the tool. The coverage on the paper appeared even, with droplets spaced ideally across the simulated leaves. “And that is what might be most important about this strategy. While the droplets are attracted to plants, they are repelled by each other,” said Deveau. The charge on the fine droplets is strong enough to make them repel each other, keeping them apart and ensuring that the coverage is very even. 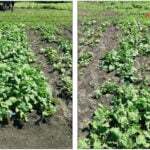 “For fungicide and insecticide this has a lot of potential. But the downdraft part of this was shown to be a problem when used on bare soils in spring or fall. It needs to be carefully managed to keep from bouncing droplets right back up from the ground, and there are ways to do that,” he said. Deveau said there are likely opportunities to make the technology more applicable to broadacre cropping operations and herbicide as well. 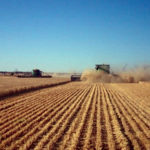 “For higher value crops that need this kind of coverage, like beans (including lentils and chickpeas), this can deliver greater coverage,” he said. Martin Brunelle of MS Gregson in Quebec built the Electrostatic Spraying Systems machine demonstrated at the Woodstock show. “We build them to match farmers’ needs. The biggest so far was 90 feet. They have been purchased by specialty crop growers but we are getting interest from bigger acreage commodity-crop farmers lately,” he said. “We can do five to 1,500 gallon machines,” he said. 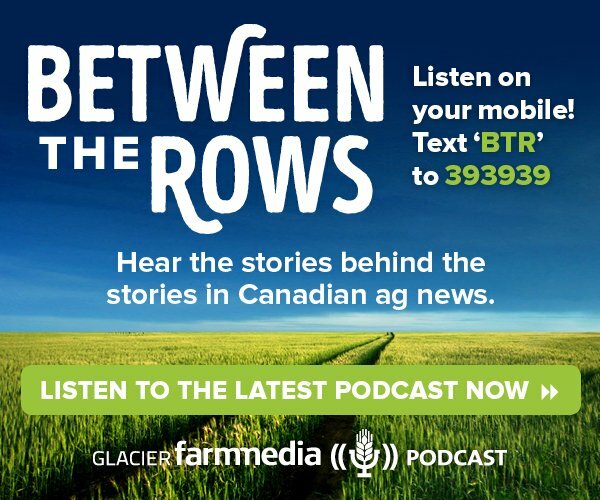 “Most go to farmers treating for sclerotinia in crops like carrots. Or for putting Bravo down for potatoes. Late blight in potatoes is treated with these machines,” he said about the system, that typically is used with about 10 gallons of water per acre. But the machines are not intended to replace the boom sprayer that is now on the farm, at least so far. 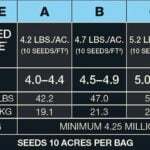 “As it sits right now, do not put herbicide in these machines. They are too prone to drift. 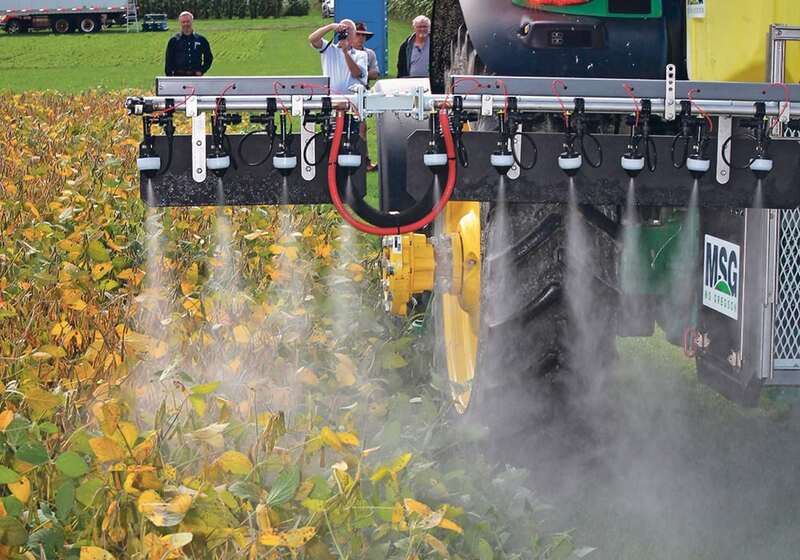 Most herbicides require coarse or even ultra-coarse nozzles,” he said. “We’ve got a real opportunity to take a closer look at these systems over the next year or so and decide if would could marry the electrical charge and the (downdraft) air to more traditional nozzles that let us manage droplets in other ways,” said Deveau. Brunelle said his company hopes to work with researchers in Canada to develop broader applications for the products. 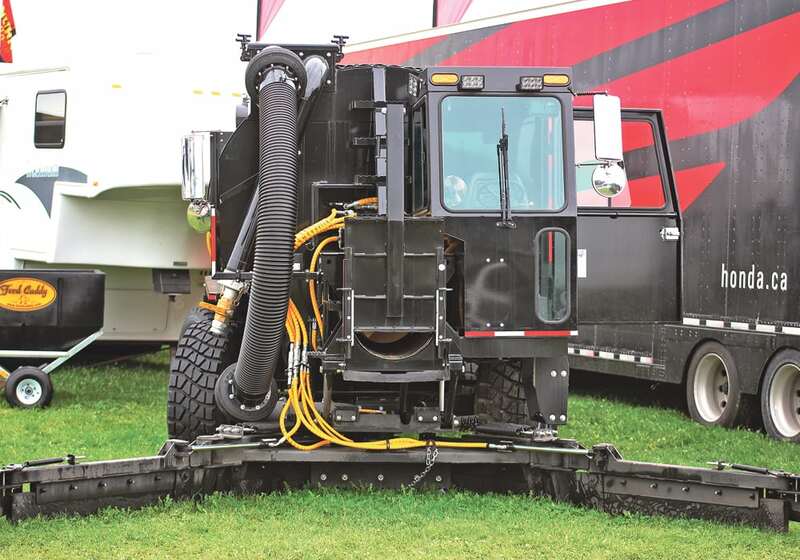 There are three companies in North America that build the machines, with a variety of distributors.